I have recently posted a first version for a FreeRds backend for weston, the reference compositor for wayland. In this post, I will talk about that new compositor, if you have already read my post on the FreeRdp compositor you won't be lost. FreeRds is a work-in-progress project that aims to provide a RDP server using the FreeRDP library. Xrdp was based on rdesktop, you can see FreeRds like its successor but with FreeRDP as the foundation classes. FreeRds and the weston backend communicate with a unix socket and a shared memory. The socket is used for commands and the shared memory for the shared framebuffer. FreeRds takes care of all RDP related stuff, and the job of weston is to create the content to display. 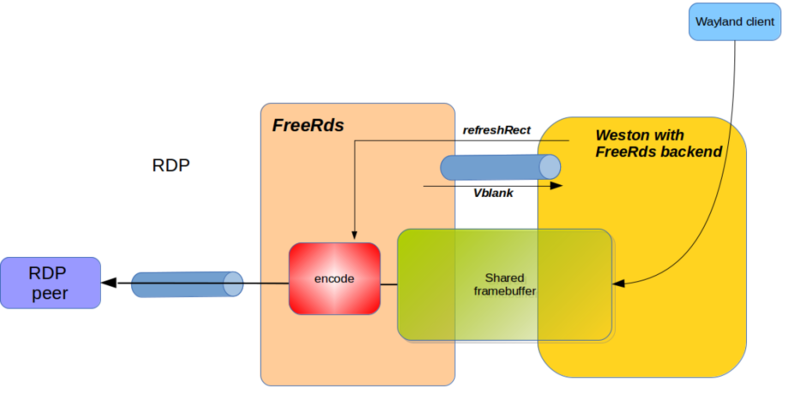 FreeRds receives the refreshRect packet, it encodes the damaged regions using the appropriate codec (raw, compressed or not, RemoteFx or NsCodec). A VBlank packet is sent to Weston.